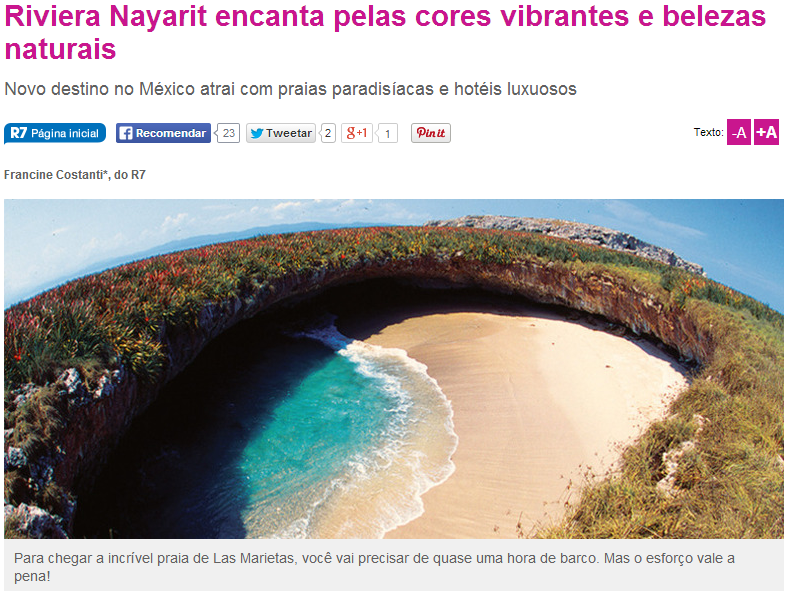 A representative from Brazil’s second-largest web portal, www.r7.com, came to the Riviera Nayarit on a FAM trip sponsored by the CVB; she has already published the first of two pieces online that will be viewed by millions of Brazilians. The public relations activities accomplished by the Riviera Nayarit Convention and Visitors Bureau to expand the destination’s exposure in specific markets are targeted, effective, and meeting and exceeding goals. Brazil is an emerging market and full of potential tourists to the Riviera Nayarit, so the recent FAM trip for Francine Costanti dos Santos, a journalist for www.r7.com, was right on the money, as her publications reach the entire country of Brazil and other Portuguese-speaking countries around the world. The article was posted on August 18th, and highlights the destination and its hotels; there is another in the works dedicated to the activities guests can enjoy while in Mexico’s Pacific Treasure. Francine’s trip was lengthy and filled with so many events that there’s a good chance she will publish more than the two she was currently assigned. The investment made in the journalist’s trip was well worth the amount of impressions and views her articles will net for the destination. The R7 website touts 47.1 million unique visitors per month, 77% of which belong to the A and B socioeconomic groups. R7’s Facebook account has nearly 8 million “likes;” on Twitter they have a little over 3 million followers and on Instagram another 30 thousand. Last May, R7 published one of the releases sent out by the Brazilian PR agency handling the Riviera Nayarit CVBs account in that country. It was thanks to the extensive reach of this communication that the four continents where Portuguese is spoken were made aware of the destination. This is the kind of ally the Riviera Nayarit is needs and is searching for in order to reach the markets it’s courting. This way, they can access as many people as possible while taking full advantage of the resources available. To read the original pieces please click here: http://entretenimento.r7.com/viagens/riviera-nayarit-encanta-pelas-cores-vibrantes-e-belezas-naturais-18082014.